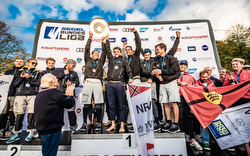 (Hamburg, Germany)- The Norddeutscher Regatta Verein (NRV) from Hamburg were crowned as Champions for the 2018 German J/70 Sailing League for the fourth time! After their title wins in 2013, 2014 and 2017, the Hamburg team kept their nerves in front of the home crowd, defend their championship title and collecting the fourth star for their jersey. "The event here in Hamburg, as well as the whole season, was nerve-racking and every time a tough fight. Everything can happen and, therefore, it was exciting to the last second. But, that's what's special about the league. In the end, it went perfectly for us and we are super happy and satisfied," explains Tobias Schadewaldt (helmsman). His NRV teammates included Johann Kohlhoff, Klaas Höpcke and Malte Päsler. The NRV team record was Friedrichshafen (1st), Tutzing (8th), Travemunde (1st), Berlin (1st), Kiel (5th) and Hamburg (1st) for a total of just 17 pts in those six events. Another 8 pts back, taking the silver on the podium was Bayerischer YC with 25 pts total and the bronze went to Wurttembergischer YC with 34 pts. The balance of the top five included Wassersport-Verein Hemeligen in fourth with 34 pts and Verein Seglerhaus am Wansee in fifth with 40 pts. In addition, the final regatta in 2018 was also about qualifying for the SAILING Champions League. 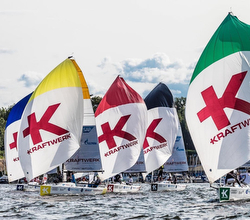 The four best clubs get hold of a starting place in the SAILING Champion League Semifinals for the 2019: Norddeutscher Regatta Verein, Bayerischer YC, Wurttembergischer YC, and Verein Seglerhaus am Wansee. A big thank you to KRAFTWERK, Audi, SAP, Gazprom, Nord Stream, Marinepool, BAY, Dusseldorf, FSE Robline, Budweiser Budvar, North Sails and Mittelmann's shipyard. The sixth season of the German Sailing Bundesliga would not have been possible without the support of these strong partners. For more German J/70 Sailing League information Add to Flipboard Magazine.